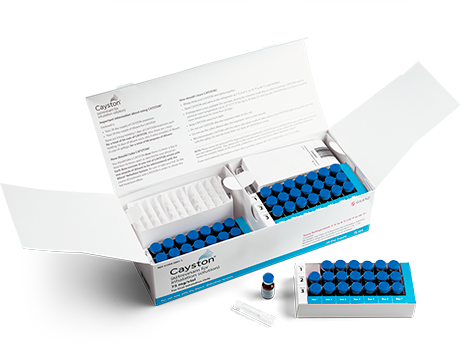 To provide full support for the Altera® Nebulizer System, CAYSTON is only available at specialty pharmacies. You can get CAYSTON through the CAYSTON Access Program® or by having your doctor send a prescription directly to a specialty pharmacy. Be sure to understand the options available to you when choosing a specialty pharmacy to fill your prescriptions for CAYSTON and other CF therapies. Check to make sure the specialty pharmacy you choose is covered by your insurer. Call in advance for refills – Be sure to ask how much time the pharmacy needs to process your order and prepare it for shipment, and how long it will take for the package to reach you. Ask if a signature is required for delivery – If your CAYSTON is being shipped overnight, it may require a signature upon delivery. If you can't be there to sign for it, make sure someone else can accept the package on your behalf. You can also arrange to have it shipped to another location (work, school, etc.) where you or someone you trust can provide a signature. Know what to do if there's a problem – Your specialty pharmacy will have a toll-free number you can call if they have pharmacists and patient coordinators on call. Don’t hesitate to call if your shipment doesn't arrive on time, if a part seems to be missing, or if you’re not sure how to store your medicine. You can also call the CAYSTON Access Program at 1-877-7CAYSTON 8am-8pm EST, Monday through Friday. You can sign up for refill reminders that will alert you when it’s time to refill your prescription using My Cayston Partner®.